Lovely water lily earrings made of sterling silver. Try them with matching water lily pendant. 2 cm, 4.1 g.
Little lotuses with oval shape around them. They are small and light-weight. 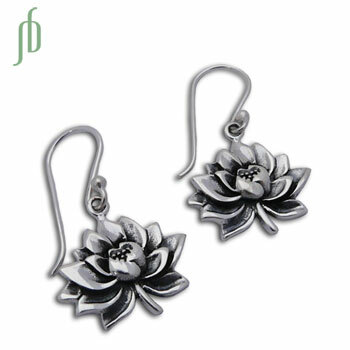 Perfect earrings for lovers of lotuses and nature. Sterling silver. Our original five petal Lotus Pendant with a brushed-matte finish for a chic and modern look on a 3-string necklace color of your choice. Necklace is adjustable from 16-17" (40-42 cm). Choose from 8 colors.